Living conditions in Gaza are so bad that they’ve been described as ‘less than human’ and potentially uninhabitable by 2020, the United Nations said on Tuesday.The warning comes from the UN trade and development agency, UNCTAD, in its report into the Palestinian economy. In addition to severe crises linked to water and electricity shortages, the UN agency says that Gaza’s 1.8 million residents have yet to recover from the destruction of last year’s conflict with Israel. 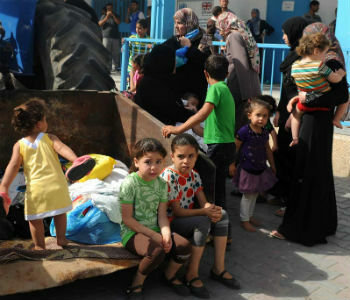 Three wars in six years and eight years of economic blockade have been blamed for terrible living conditions in the Territories Occupied by Israel, the UN trade and development agency (UNCTAD) said Tuesday. In its latest report into Gaza and the West Bank, UNCTAD experts warn that development is not merely hindered, but reversed. In fact, the figures show that for the first time since 2006, the Palestinian economy has gone into recession. The conflict in 2014 was particularly damaging, with whole areas of Gaza still flattened by attacks. So says UNCTAD’s Mahmoud Elkhafif. Israel is criticised for withholding almost USD $700 million of import tax revenue from the Palestinian authorities in the first four months of the year. According to the UN agency it’s the sixth time Israel has withheld the monies since 1997, which are far and away the main source of public revenue in the West Bank and Gaza. In another sign of the deteriorating conditions on the ground, UNCTAD said that in the year 2000, 72,000 people depended on food aid, but now that number has risen to almost a million. And in Gaza, unemployment is as high as 80 per cent, the UN agency said.